Day Two — Today was the real start of the rally. Two events on Friday. The first was a daytime sightseeing ride aimed at showing the out-of-towners the sites around the Twin Cities. Being a non-native, I wanted for sure to be on this ride. 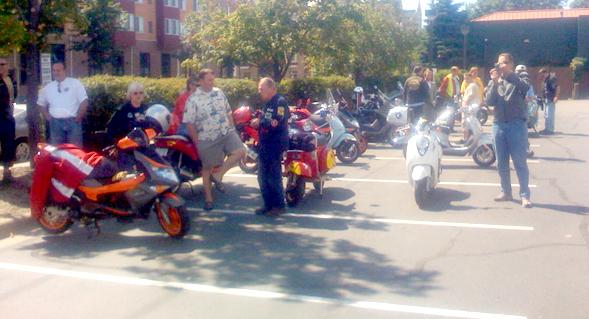 Starting at the official hotel, about 40 scoots gathered for what was supposed to be a small, informal ride. But with that kind of turn-out, a couple of us had to step up and do some ad hoc blocking to get everybody through the intersections. All well and good by me. We pulled away from the hotel and headed for the state capitol in St. Paul. I really have no idea how we got there. I had this surprise realization moment as we passed the St. Paul Cathedral that somehow we’d wondered into the eastern twin city. I’d never actually been to the capitol before, and though I didn’t go in, I couldn’t help but appreciate this seat of state government. The group stopped. Some went in. Others took pictures. Some stood ’round and smoked. I got into an interesting conversation about alternative energy storage technology and what struck me most is how quickly people dismiss something that’s new. I’m an avid skeptic, but especially with alternative technologies, it’s like people only see the problems and not the possibilities. With nearly 50 scooters lined up in front of the capitol building, it wasn’t long until the fuzz showed up. But to his credit, the capitol security cop simply seemed interested. We did all sort of take his squad car’s presence as time to saddle up. He wished us a safe ride and we were on our way. John, our tour guide, led us then to two rather interesting locations, neither of which we actually toured. The first was essentially the original Minnesota governor’s mansion, and the other was basically the corporate headquarters for the english fur trade industry around the time of the war of 1812. Our final stop was actually Fort Snelling, which was established precisely to drive out the english fur trading influence and push the english back into Canada where they presumably belonged. It turns out that John, our illustrious tour guide, is also a volunteer at Fort Snelling. He managed to get us all free passes and a very personal tour around the fort. Fort Snelling sits strategically high above the intersection of the Minnesota and Mississippi rivers, making it a key northern stronghold. The current fort, which sits like a giant, diverting boulder in the modern river of highway traffic, is essentially a rebuild on top of the original grounds. Trying to capture life there in a snapshot ’round the 1820s or so, there is a full-time seasonal staff of period reenactors who do everything from laundry, to blacksmithing, to cooking. The tour capped off with a demonstration firing of one of the fort’s six pound field artillery cannons. Fantastic!